2016 was a very busy and bittersweet year for all of us at the AHPS. We had fun at shows and events. We grieved the loss of some of our friends and we worked very hard at continuing our commitment to "preserving the past for the future". No Limits staff attended 5 Goodguys Rod & Custom Association events and (sad to say) the special Goodguys event honoring the late Gary Meadors (founder of Goodguys) in February. In addition to these Goodguys events, we attended 2 local shows in California, one in Portland Oregon and Ray Evernham’s Americana Live event in North Carolina. Of course we had a full complement of staff at this year’s SEMA show in Las Vegas. Lots of cars, trucks, rods, customs and racers – WOW !! We published contributions from our friends such as Steven Cox – Sopwith Motorsports Television Productions, Driver, Boschett Timepieces/McGunegill Engines #33 and Co-host, Mecum Auctions on NBCSN – Bob Boberg of eclassicauto.com and from Colby Martin of SEMA SAN. We were fortunate to have interviews at SEMA with Edelbrock, Coker Tires, Royal Purple and Meguiar's as well as noted personalities such as Dave Kindig of Kindigit Design and the TV series “Bitchin’ Rides”. We learned a lot and hopefully passed it on to you. Sad to say we lost one of our funding members and past President – Eric White. All too soon and we miss his guidance. Of course the primary work of the AHPS moved on with continued digitization of historical advertisements, brochures and magazine articles from American automobile manufacturers from the 20’s to date. We added 11,000 pages to our ever growing Eric White Digital Documents Library. 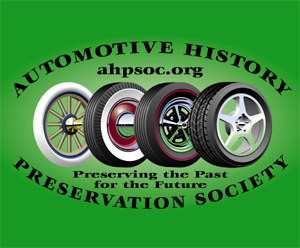 The AHPS continued to increase our visibility in the automotive world this past year. Articles profiling our members and their cars appeared in Hemmings Motor News, and SEMA’s SAN Ignited eMagazine. Speaking of member’s cars – your AHPS directors and officers are true car guys. Here is a sample of the cars we are “playing with”. Kurt Shubert’s 1965 Oldsmobile Jetstar I four-speed car (profiled in Hemmings), Wayne (the “Plymouth Doctor”) Brandon’s 1937 Plymouth, Bob Gerometta’s 1967 Plymouth Hemi, and your editor’s 1968 Mustang Fastback.